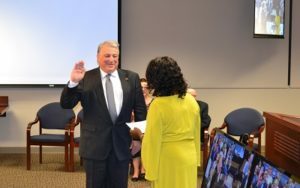 In a ceremony that took place May 27, Spencer Fane Partner Andy Lester was sworn in to the Oklahoma State Regents For Higher Education by U.S. district Judge Vicki Miles-LaGrange. “There is nothing we do as a society that is more important than higher education,” Lester said after taking the oath. Appointed by Governor Mary Fallin, who called him a “champion for education,” Lester will serve a nine-year term as regent. He was a regent for Oklahoma State University and the A&M Colleges from 2007 until last month. 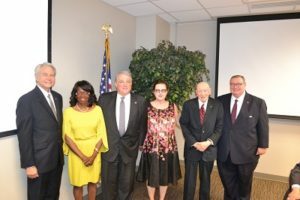 The State Regents prescribe academic standards of higher education, determine functions and courses of study at the state’s 25 public colleges and universities, grant degrees and approve each public college’s and university’s allocations, as well as tuition and fees within the limits set by the Oklahoma Legislature.